The PVTRIN e-learning platform is a 24 hours virtual classroom environment, providing flexibility and freedom to study or test where and when it's most convenient. A range of online training supporting materials (including practical exercises, cases studies, audiovisual material and additional resources) are accessible to trainees undertaking the PVTRIN training course. provides technical support to the certified installers for knowledge and skills development, beyond the training course. 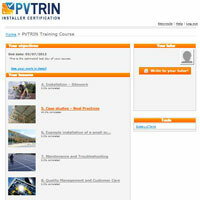 The PVTRIN e-learning platform will be accessible only to registered PVTRIN trainees, PVTRIN trainers and certified installers.